Businessman gets five years in jail for shares theft | Russian Legal Information Agency (RAPSI). MOSCOW, March 15 - RAPSI. The Presnensky District Court in Moscow sentenced on Thursday businessman Alexei Kozlov to five years in prison for stealing shares. Kozlov was placed under detention in the courtroom. He has already served three of his five-year term. Under the new sentence, he will have to spend one and a half more years in prison. Kozlov's case has been one of the most high-profile in Russia in recent years. He and his wife journalist Olga Romanova claimed he was framed. They managed to secure the sentence reversal in the Supreme Court. Investigators maintain that Kozlov and his accomplices used fake documents and sham companies to steal 626,000 shares in a company producing imitation leather and films. 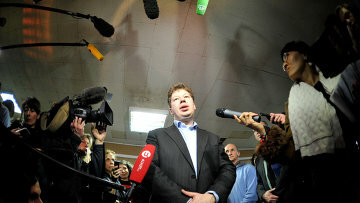 A Moscow district court sentenced Kozlov to eight years in prison in March 2009. The Moscow City Court reduced the sentence to seven years in July 2011. 18:11 15/03/2012 The Presnensky District Court in Moscow sentenced on Thursday businessman Alexei Kozlov to five years in prison for stealing shares.